Children When it comes to children and the bathroom, the space should be a fun learning place. Unfortunately, the room is sometimes associated with negative feelings, often because of a fear of wateror the tedious business of brushing one’s teeth. An atmosphere of security may help more than too-bright designs. With a simpler, easily maintained environment, a problem can be easily solved when something goes wrong. Children need space and security above all in the bathroom, but they also will need to have access to things outside their reach. When furniture, toilets and sinks are not appropriate to their size, there needs to be something to bring them up to a suitable level. A simple stool or even a slide-out step hidden in the cabinetry can boost them up as they grow. Keeping in mind their height and vision levels, consider hanging artwork at a lower level and putting individualized towel hooks at their reach. Singles For most bathroom users who live alone, the room is a place to ready themselves for the day and wind down in the evening without having to consider others. For that, they want space for individualized elements: pictures, accessories and personalized touches. Especially the Millennial generation will want colors in the bathroom they can change on a whim, as well as fashionable details and technical gadgets. They are still experimenting with lifestyle and will appreciate a flexible design. At the same time, younger people will want the same ease of comfort and easy maintenance to keep up with busy schedules. The bathroom should be easy to clean with enough taste to host guests. In addition, singles are more open to green design and fun ways to integrate technology in the bathroom, like Kohler’s Moxie showerhead. Families Families need room for improvisation. When several people live together, particularly multiple generations, the bathroom becomes a place of communication. They have to take care of one another and learn to compromise. Perfect styling rarely counts here, so the emphasis should be put on the room’s tolerance on inevitable chaos. Multi-functional features such as walk-in showers and spray-proofed bathtubs, as well as countertops and sinks that are within everyone’s reach, are good solutions. If there is room, plan separate zones for different activities that need to be done simultaneously. A separate toilet room has gradually become more popular in all types of bathrooms, but if possible a separate washing area for just parents or just for children would be helpful. A screened-off dressing area with a built-in unit or shelves, or even a larger shower area, would allow for additional privacy. Elderly Every step should be thought out in this bathroom so that nobody slips or stumbles. This security correlates with freedom – freedom of movement and freedom from tiresome safety features. A familiar environment, the right technical fittings and a barrier-free living space provide a sense of safety. People who have to cope with restricted movement know how important an accessible, secure and usable bathroom is for independence and wellbeing. Walk-in showers and space to move are basic prerequisites for a universally designed bathroom. As people are living longer, they are also more active in their later years. By keeping the bathroom barrier free from the beginning, aging won’t be as frustrating down the road. Aspects like wide door openings and plenty of space around the washbasin are essential. Toilets and sinks that are easy to clean, like Duravit’s first barrier-free rimless toilet, are particularly important to people with limited mobility. A raised seat, normally at 18 to 19 inches, is suitable for the physically impaired or those with extra height. 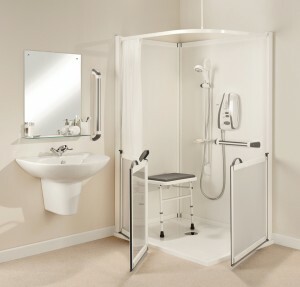 Wheelchair-accessible washbasins are also a common comfort, and if a wheelchair isn’t necessary, a stool might be added. A wheelchair accessible sink should be at least 26 inches high and 11 inches deep.